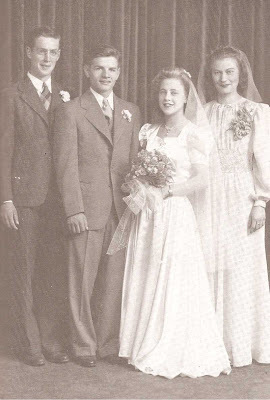 Today, May 6th marks what would have been the 70th wedding Anniversary for my Mom and Dad--Mai & Bob. Here they are on their Big Day May 6, 1942. This was before Dad went off to WWII and all the harrowing history that followed. Mom saved her wedding dress to the very end. It was tough to have to throw it away and really tugged at my heartstrings. However, it was damaged and there was no new home for something that carried so many memories for her. They were actually able to celebrate their 50th Anniversary together in 1992 in Clarkdale Arizona's Catholic church. They renewed their marriage vows and were as much in love then as the day the above photo was taken at St. Lawrence in Lafayette, Indiana. I've long since forgotten who the Best Man and Brides maid were. I hope the Good Lord marks anniversaries for loving couples up in Heaven. Maybe they are flitting around with their Angel wings on. May their memories live forever! I Love You, Mom & Dad! Happy Trails Forever up there in Heaven together.